Ok, we know keeping a budget is important. Why not the faster 49cc on the market with some style to back it up!? Want a more sporty look without the bill to go with it? Escape the ordinary and break free with a VERY HARD TO FIND 2 stroke power house! Factories are so busy pumping out affordable FOUR STROKE engines that most ignore the true scooter style. 2 stroke engines are a part of history with that special sound to make any head turn. All the true scooter forums point to the Road Runner 49cc Gas Motor Scooter! We have noticed a very large customer base comes to us with this question and here is our response. There is something about this moped that attracts special type. Something no one else has? 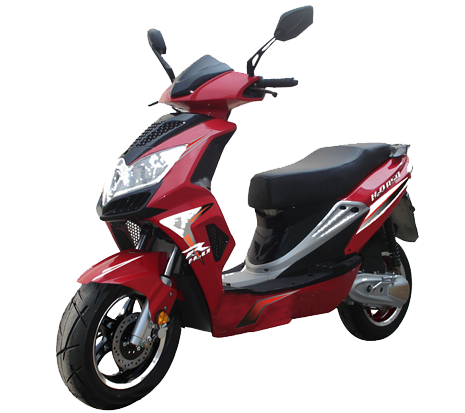 We have introduced an even better deal and actually is faster than any other 50cc moped on the market. Save a ton of cash and have a blast showing off while your doing it with ultra bright zeon lights ( like you see in exotic cars ). Fast, Fun and our most affordable 50 higher performance scooter online. This model has full parts support and is supported by countyimports.com. If your looking for a new moped and don't have a lot of money but still want power and quality. This unit IS the moped for you. This is a very nice quality college cruiser and at a price that is unbeatable, actually the best price in the entire industry. The perfect A-B cruiser. Gas milage so good you might forget where the gas station is! (MPG 115 MPG). -2- STROKE ENGINE - LIMITED STOCK! Free Technical Support 877-868-5828 on all products purchased from our website. We are very gracious to gain you as a customer. Please sign up for our mailing list during checkout or on any page. We send several emails automatically to your inbox on the entire shipping process, step by step. We beleive in keeping our customers in the loop and informed of how our process works every step to your door! We look forward to working with you and please feel free to send us an email at any time letting us know what you need! We are also available 24 hours a day 877-868-5828. Please contact us anytime you like with your service or sales needs! We have afully functional website for your parts needs unlike any other dealer. We are established and dependable- We have been in business for over 6 years and are growing rapidly. For over 6 years, we have gained tremendous experience serving thousands of customers in high dirt bikes, go karts, and scooters. Our knowledgeable staff is enthusiastic, helpful and courteous; we have a great attitude and want your business. We care about our customers and make ourselves easily accessible. Our toll-free number is 1-877-868-5828. Your satisfaction is our #1 concern. Why get yourself all frustrated & try to get hold of a company never answers the calls? Pick up the phone dial our Toll Free 877-868-5828. We guarantee you will find the best customer services here you deserve. We stock all common parts for all products we carry. Call us at 877-868-5828 and get your warranted replacement part(s) shipped free of charge. If you purchased your Dirt Bike, Scooters or Go Kart from us - you are special and will be given that special treatment each and every time you come back. We offer replacements parts at extremely low prices even if your warranty has expired! Just FYI, if you have any frustrating friends, co-workers, family members are looking for replacement parts that they could not get from where they bought their bikes from, have them call us! We provide 80% of the spare parts on the market, not just to end users, even the dealers! 9. We support our Troops! ¡§C Exclusive Military and law Enforcement Discount: Supports Our Troops! We know you're job is tough that's why we make it easy for you to order the products you need and get it to you as quickly as possible. For more information, please contact one of our sales representatives at 877-868-5828 or see our FAQ page! Are the publicly traded? Do they have 3 Physical Store locations? How about a parts department with over 60,000 parts in stock? We may be bragging a little but we are very proud of our company and what we offer becuase we know out right, noone else can asker yes to those questions we can! Most other online dealers will ship your scooter to a terminal which could be hours away from your home, ours get shipped directly to your door. CMS also provides lift gate service at no additional charge. This means your new purchase will arrive directly to your residence at NO EXTRA COST! CMS offers our product at a wholesale price. For each items specifications and assembly requirements please see each individual item description for what assembly is required to complete this purchase. Although assembly is generally easy depending on the model if you cannot perform this task please let CMS know so we can help find a dealer in your area to perform this task. Should you have any questions about our product feel free to call us anytime during normal business hours M-SAT 9 am- 5 pm PST - 877-300-8707. THIS IS AN AMAZING SCOOTER/DEAL!! !